Who knew that being an Engagement Photographer and wandering around downtown Tampa taking photos of an adorable couple would lead to the death of my Blackberry Curve cell phone? Haha. 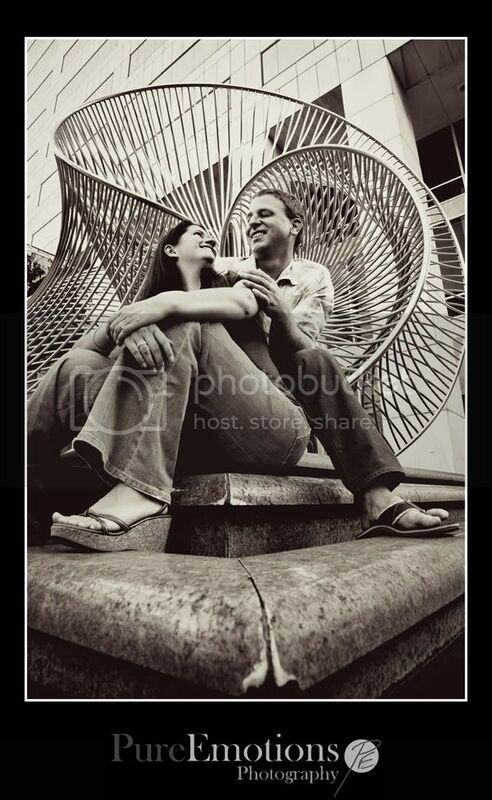 A few months back, Erin and Brett booked us to shoot their engagement and wedding photos. When they walked in the door to our home to look at more of my pictures, Brett noticed one of our guitars in the corner of the room. Before they left, he was playing the guitar and singing! This was during our first meeting. Erin looked at him with love as he sang and it was at that moment that I knew they were the perfect couple for my style. Quirky, fun, outgoing, unafraid and in love. Their wedding is on June 20th!! I can't wait to shoot it! Okay, so back to the death of my phone. 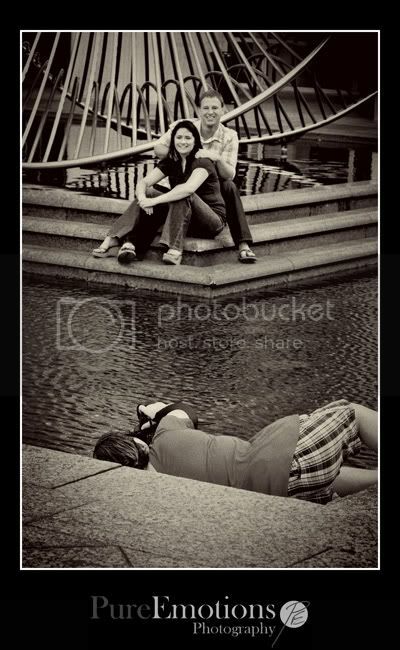 Erin and Brett and myself and Latanya all met up tonight for their engagement photos. It was truly a day of mishaps but filled with fun. I've been sick with a bad cold for the past 8 days now. Luckily, Latanya is an awesome assistant/ photographer/ best friend/ everything one could ever want or need by their side kind of person! So, she was able to carry most of the heavy stuff and she got the shooting started off while I took it slow. We started out shooting in a parking garage for a grunge kind of look but unfortunately, the air circulation in there wasn't very good so we didn't get many shots because Brett starting sweating really bad and turned pale in the face and his eyes looked bloodshot. I was so scared, I forgot I was sick! I gave him a bottle of ice water from my cooler and Erin cranked the AC in the car and he started feeling better! Whew! So, we went outside and luckily it was fairly overcast so not anywhere near as hot as it could have been! Yay! So, we start taking more photos and we stumble across this really awesome metal, silver statue/ structure thing-a-ma-bob. It's actually in water and surrounded by water but there are these tiny steps all around it that you can walk on. So, we get them to pose around it and we keep snapping photos. So then I lay on the steps on the edge of the water across from where Erin and Brett are sitting by the statue and start taking photos. So, there I am shooting away when I realize that this is the place that I can get my signature shot. 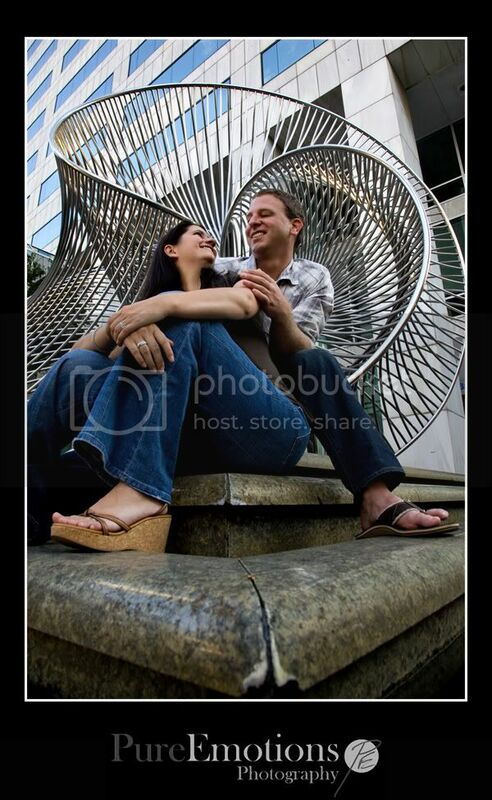 On every engagement session I do, I try to get the couple in front of some sort of large structure with leading lines and I put the camera by their feet and shoot up on them having them look at each other. Looking down is never flattering so I have them look up and at each other. So, I realized this is the place to do it. Only problem is that there's nowhere for me to be close to their feet without being in the picture unless.... well unless I get in the water! So, here is the shot that costed me my cell phone. (sorry, Latanya didn't get the photo of me in the water. She was too busy taking my sim card and battery out of my phone and trying to dry it for me while I continued shooting)! and in Black and White just for you, Brett! More to come soon! Hope you enjoyed the photo and the story. This photo will earn a spot on my website soon and will always bring back memories of Erin and Brett and the cell phone tragedy. May it rest in peace. Too bad about your phone... but that shot you got is awesome! lol! What a story! The picture was definitely awesome- I really like the b&w version, too.